How do I Recycle my Old Computer Monitor? One of the main items on any new graduate’s college must-have list is a new computer. Computers are a necessity for many college students, as emails and writing papers are a weekly, if not daily, occurrence. However, at the end of a computer life cycle, do you know how to properly recycle or dispose of it? Why Can’t You Just Throw it Away? Used electronic devices, also known as e-waste, are increasingly becoming a larger part of consumer’s waste. Most students may not realize that you can’t just throw an old computer into the garbage can. 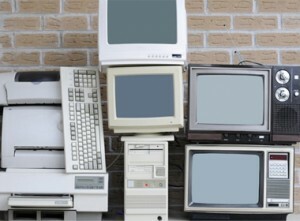 Like many electronics, computers contain heavy metals that could pose an environmental threat when disposed of improperly. Many computer manufacturers and computer hardware manufacturers also have their own recycling or trade-in programs including Apple, Dell, Hewlett Packard and others. A Mr Junk tip: Before recycling your old computer, it’s important to remember that all data must be erased from it before having it picked up for recycling. The Mr Junk team is educated in how to recycle your computer and monitor properly and safely, avoiding the potential of it ending up in a landfill. In addition to computers, we also pick up other appliances and devices like refrigerators, dishwashers, televisions, printers and copiers. If you’ve just upgraded to a new computer and don’t know how to properly dispose of it, don’t hesitate to contact us for an estimate for a pick-up!